Yin yang tattoos are very innovative ones developed from Chinese culture.Tattoos generally express people’s individual feelings and what they actually are.Yin yang tattoos describe the ultimate fact of life that one struggles to achieve. The meanings and symbols are originated from the philosophy followed by Chinese people. Yin yang tattoos are circular in design divided into two parts that are normally colored in black and white. The tear-shaped two parts meet each other to fill up the circle. The black part is called yin and white portion is called yang.That is why the tattoo design is named as yin yang . Yin yang tattoos are mostly seen in the western world. Yin yang is popular among the tattoo lovers because of its meaningful sketch and universal appeal. In Chinese belief the black portion is considered to be featured with female attributes and white is thought to be characterized with male features. The female one is malevolent and male one is possessed with creativity, benevolence. The end of each part meets the starting portion of the other. What does Ying Yang Tattoo Signifies? In short Chinese philosophy affirms that in spite of the contrast in nature the opposite parts attract each other. This again symbolizes unity that cannot be avoided despite the complete mismatch. The two parts complete the basic five elements of the Universe-water, fire, earth, metal and wood and thus brings forth the harmony in contrasting beings. The very interpretation gives birth to several aspects to be revealed. The concept is of opposites bounded in such a balanced way that neither of them can exist without the other. They are contrasting yet complementary to each other. None of them is as powerful to beat the other. Each quality is interdependent and interrelated which means they are unable to perform independently and each contributes to the completeness of the other. This is true for every natural phenomenon like day and night, life and death, light and darkness etc. Both the parts coexist and has a beginning and an end. One’s end gives way to the other’s beginning which is artistically depicted in the design where both portions divide or meet. The two parts balance as well as destroy each other. At the extreme point one form changes or dissolves into the other. There is always the presence of one part into the other and vice versa. The fact we discover from this yin yang philosophy is that nothing in this world is absolute and permanent. Everything is subject to decay. Life ends in death and death ends with the beginning of a new life. Everything has a positive and a negative side and though they are opposite in nature they are two different halves of one same particle. The female part symbolically acts for passiveness, water, earth and the male one is imagined as active, air and fire. Yin yang tattoo can consist of opposite patterns or themes like darkness and light or may contain pictures with contrary ideas like fire and water. Feelings or emotions which have meaning opposed to each other like love and hatred,sorrow and happiness can also be the subjects of yin yang tattoos. Two creatures signifying contrast in meaning can be portrayed facing each other in a tricky way. 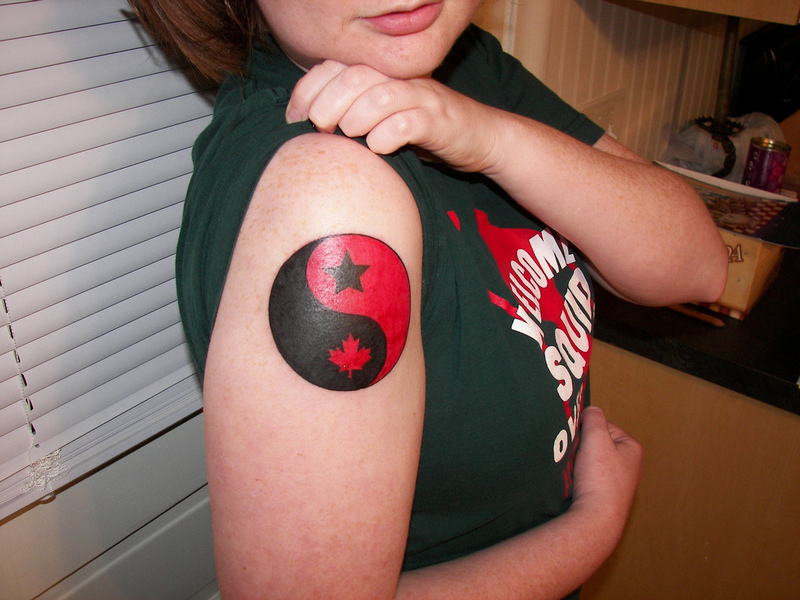 Another tattoo design can be interpolated along with the existing yin yang tattoo to make it a bit different. Not only the elements but also the color combinations can be handled with artistic precision.Two different colors can be shown to complete the wholeness in order to bring a master stroke to the pattern. Two koi fishes facing each other’s tails can be a great material to incorporate in lightening up the significance. There are innumerable figures that can be drawn on but yin yang tattoos are generally designed in black and white to show the sharpness in contrast. Colors may vary due to preferences. Even if one changes the shape of the parts into something unique or something made by his own it adds to its beauty and enhances the richness and depth. The tattoo can be made larger or smaller in sizes according to the person’s choice and the color also depends on the skin complexion. These tattoos look great if inked on upper -arm, upper-back designed in large size. One may look stunningly exceptional if small yin yang tattoos are worn on wrists,ankles or lower backs.